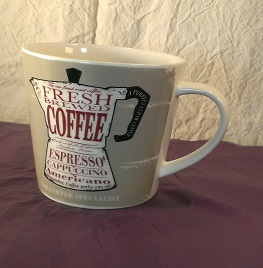 A taupe ceramic mug with 'Fresh Coffee' Design. It's a stylish retro design of a classic espresso machine on a background of muted colour. Generous size, for those who enjoy coffee in volume! There are matching coasters available in our general section.